I found the recipe for these in Delicious Magazine. They were so tasty I made them again. The rolls only stayed fresh for a day, but they did freeze well. The recipe I followed here is from the fabulous upcoming book Supper Club by the indomitable Kerstin Rodgers of Underground Restaurant fame. I’m afraid I can’t post her recipe (buy the book – it’s out in April and is a quirky little collection of really clever, think-outside-the-box, impress-your-guests recipes!) but as an alternative in the meantime, Google throws up lots of great recipes, most of them from the US (it’s an American classic after all!). If you can’t make head or tail of US cup measurements, here’s a fallback from the trusty Beeb. I made the pastry from scratch and it was all the better for doing so. 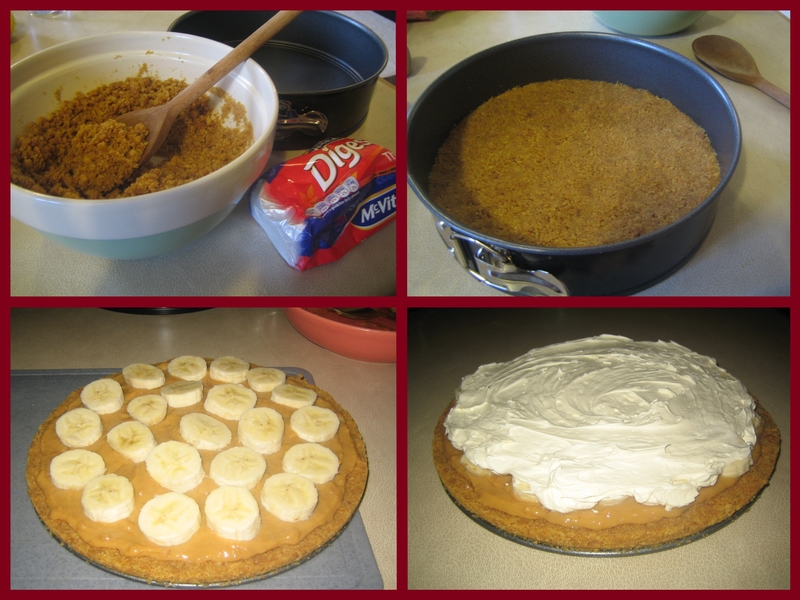 At some point over the last few years, I made myself personally responsible for Christmas Day dessert in our household. This was my 2010 Christmas offering and it was a GREAT SUCCESS. 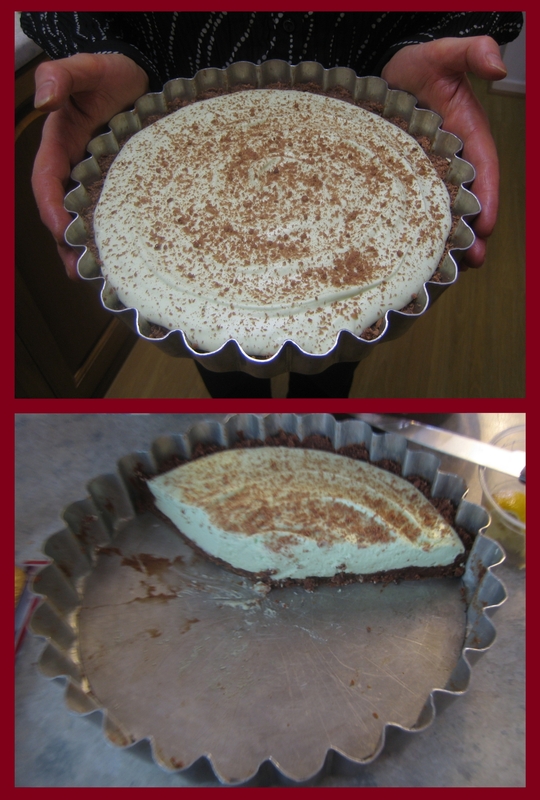 The photos don’t do it justice: the filling was a gorgeous pale-green colour and I made the base from crushed-up double-choc-chip Maryland cookies – similar to a cheesecake base but even more indulgent. Peppermint essence gave it a subtle mintyness that took the edge off the creamy marshmallow, so it wasn’t sickly in the slightest. 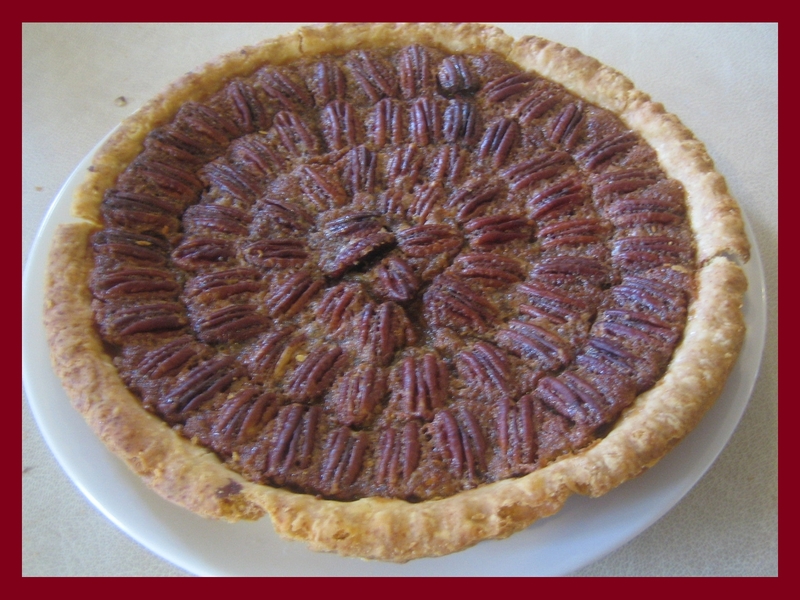 The pie was a breeze to make, and it looked really impressive. I highly recommend it, particularly if you want to serve up something unusual that many people may never have tried before. 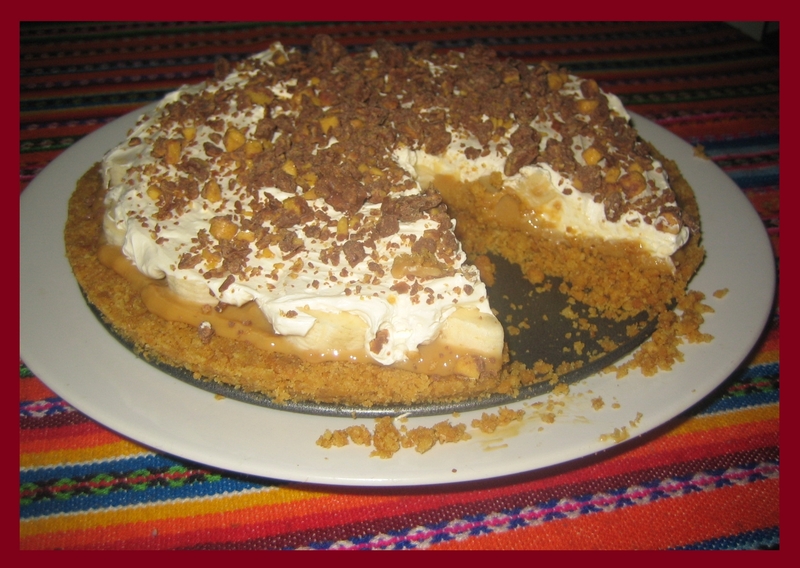 but the recipe I followed was a Hummingbird one, available in their new book, Cake Days, published in March. If you want to have a bash in the meantime, I’ve tracked down the Nigella recipe on this lovely food blog. if only to experience the novelty of the milk-to-caramel transformation. 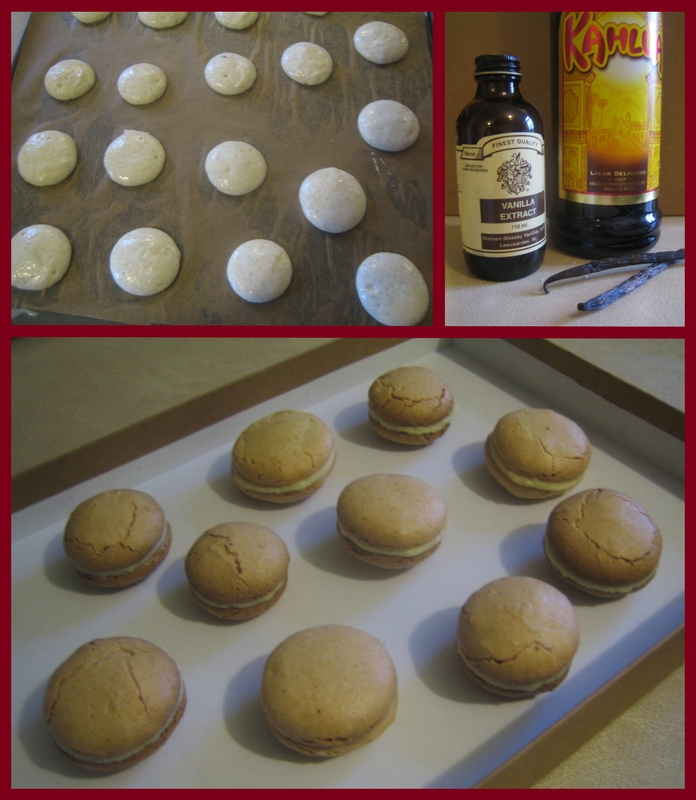 I’ve now made macaroons twice. The first time was a disaster. They were supposed to be election macaroons – yellow, blue and red – but it proved way over-ambitious for this macaroon first-timer. What didn’t go wrong? The red ones came out pink. The blue ones had a metallic taste from too much food colouring. All of them cracked across the top and stuck hideously to the greaseproof paper (a fool’s error – always use baking parchment!!!). Bah! So last week I tried again. This time, half vanilla and half orange. The vanilla ones (in the photo) were a fraction closer to success, though by no means perfect. 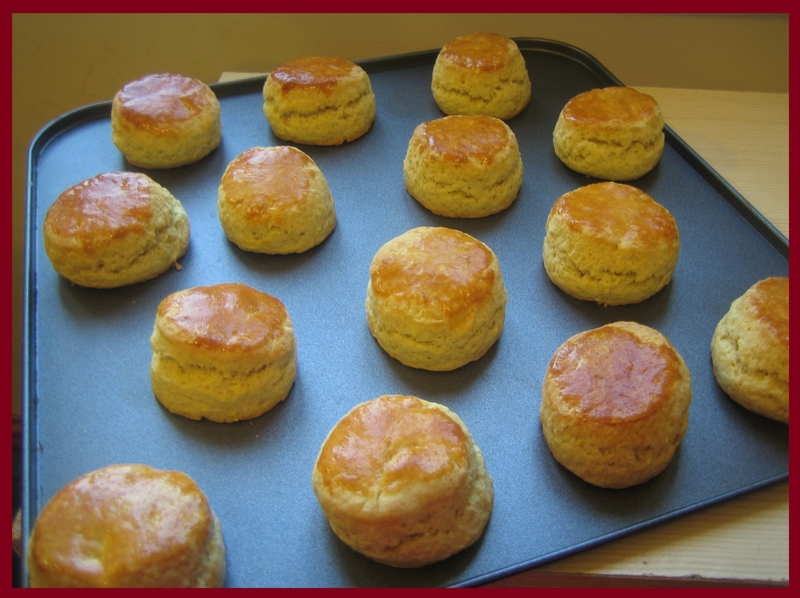 Only two emerged from the oven crack-free with smooth unblemished tops. And they weren’t light enough; the texture was too biscuity. (The Kahlua-flavoured cream was yummy however!) As for the orange ones: awful. I somehow knocked all the air out of them whilst stirring in the food colouring. I didn’t even bother to take a photo. I’m hoping for a Third Time Lucky, that is – when I can muster up the energy and spirit to try them again. Watch this space. 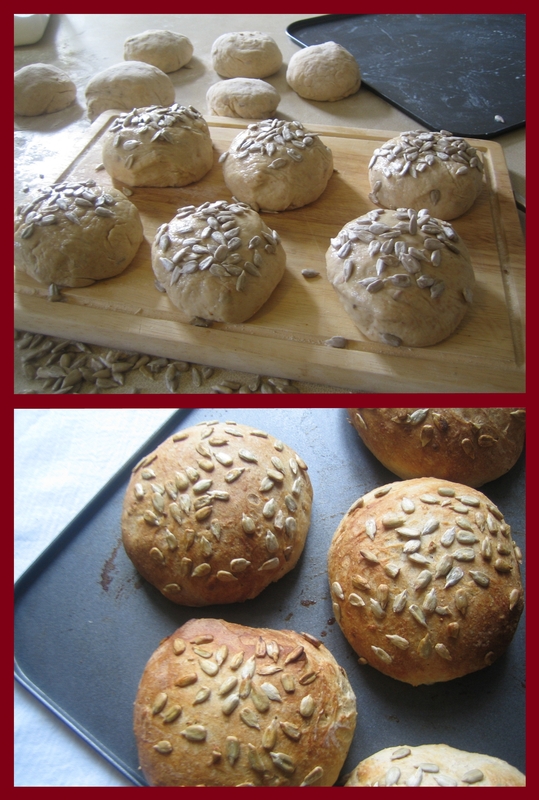 Both my attempts have followed this recipe from Delicious Magazine. I don’t blame the recipe for my failed attempts, but next time, I think I’ll try a new one. Some recommend leaving the piped mixture to stand for up to an hour to properly dry out and form a skin (I left it for just 15 minutes). I’m wondering if this is the answer to achieving crack-free macaroons. 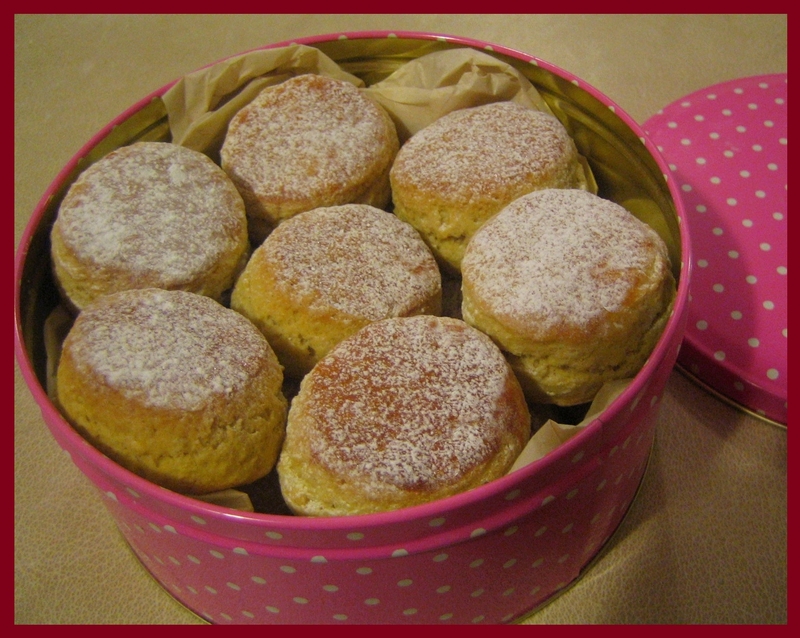 Back in October it was National Baking Week, and Becky over at Munchmun.ch challenged me to a ‘scone-off’. These cuties were my offering. We never properly judged the competition, but since we both ended up with a mountain of scones to gobble to our hearts’ contents, I think we were both winners.